A million years ago (actually 7), I worked for a luxury handbag company. Maybe you’ve heard of them? They’re called Coach. I’m slightly ashamed to admit that while I was there I succumbed to peer pressure, big time. I bought a whole lot of overpriced bags and shoes and gloves and keychains and leather accessories. I justified it with the popular, “but everyone else is doing it!” Also, I argued to my inner self, I worked really hard and deserved nice stuff. It was all a big fat lie. One thing about being a Coach employee is that it’s simply not good enough to buy the standard, off-the-shelf bags. Oh, no. Look closely and you’ll notice that certain obsessive customers and employees always go for the “Limited Edition, Special Release” bags, which cost more than double the price and have irresistible features such as snakeskin trim and price tags as high as a typical mortgage payment. It’s disgusting. I’ll tell you that the discount at Coach is very, very generous, especially compared to other retail stores. But when you’re purchasing $1,000 bags on a regular basis, even a large discount isn’t enough to dull the hit your bank account will suffer. While I was employed at Coach I was also in college with a $40,000/year tuition bill. I lived with my parents, so I wasn’t paying rent or utilities, but I still only worked part time for close to minimum wage (no, not commission) and spent all my money on aforementioned leather goods as well as clothes from nearby stores in the mall. Also, gourmet popcorn every night, because why the hell not. Despite my mounting debt, I somehow talked myself into a $750 travel bag (I rarely travel), a $300 wallet, (seriously? ), $200 sunglasses (um, yeah…), and the piece de resistance – a $900 fancy work bag. For my future fancy work life. Now, a few things. 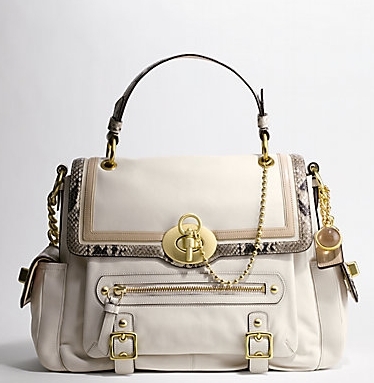 I fell deeply in love with the bag and I do believe that investing in quality over quantity is always a better option. And while it would probably take me many, many years to spend $900 on cheap imitation handbags, I think if I had purchased the bag and loved the hell out of it and used it every day for the past seven years then maybe, just MAYBE I could justify the cost. Possibly. But as it stands I purchased the bag for my someday-life, which brings me to the point of this whole post. When I bought it, I did use it occasionally, but my real purpose/justification was in using it one day when I was a career gal with a high-paying job and a corner office. I’m not sure why any of this featured in my daydreams since I’m a mediocre, unambitious worker at best who has no desire or drive to climb the corporate ladder. If it was a rare, slightly unappetizing proposition then, now it’s just a wild fantasy/nightmare. I don’t want any of that, and I never did. Even when I bought the bag, I didn’t want any of that. These days? My wallet is my phone case, I don’t even carry a handbag, and my diaper bag is some canvas sack I grabbed off the free table at work. I do not have and will never have a fancy life. I’ve thought a lot about my past visions for my future vs. eventual realities of how everything actually worked out. I’ve been bitching a lot to my friends and family about how I’m having a midlife crisis. So maybe it’s pre-midlife, but post-quarter life. I’m just having some kind of crisis. I’m feeling very unfulfilled and stuck and I don’t know what to do about it. This new job I have is really great and probably the best I can do right now in terms of full-time jobs… but. There’s a but. I can’t help but wonder what the Point of It all is. I feel grateful to have a job that pays me, but I feel guilty leaving my kids for the bulk of my day every single day. I know that I’m working to provide for them, and there is so much merit in that, but I’m missing out on their amazing little lives in order to write marketing copy for businesses. We have such a short time on this Earth. Is this really how I’m supposed to be spending mine? I keep seeking out a sign and coming up empty. I’ve also been trying to formulate exactly what I’d want if this were a perfect world where money were no object and I could do or be anything. What would I be and do? I wouldn’t be a stay at home mom, at least not 100% of the time. Even after weekends of 24/7 kid time I feel totally drained. I don’t know how full-time SAHMs do it. I would be writing things. Maybe from home, freelance, per-project. But I’d be getting paid. I would take small trips with other adults (husband?) to recharge my batteries and step away from being “just mommy” all the damn time. I would align myself with more people who shared my beliefs. Because right now I’m feeling exhausted and combative with all the negativity against what I believe, which yes, I take personally. I think the irony to all of this is that I got the fancy, expensive education to advance my career. I got the fancy, expensive bag for that eventual career. But in the end, the only reason I am forced to participate in the career is BECAUSE of the education. Had I skipped college, I wouldn’t have to work full time, because I wouldn’t be paying $1,000+/month for student loans. Not that I could have known that then… but wow. And that’s on me. Obviously. I am not saying anyone but me should have to (literally) pay for this gross miscalculation…however, I do reserve the right to complain about it because venting helps me feel better. I think. And the whole thing is just silly. Because I learned nothing in college that actually helps me in my current (non-fancy) career, or in any career for that matter. All of my skills either come naturally or through on-the-job training. But of course no one would have hired me without that $100,000 piece of paper. It’s all such a racket. And honestly I would just sell the stupid thing on Poshmark, taking a loss but making a few extra bucks for groceries or diapers or something else disgustingly practical that I need in my unfancy real life, but a part of me is still holding on to the fantasy that maybe, one day, it will make sense for me. I still think it’s pretty.